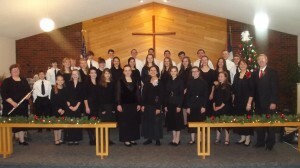 The Gloria Choir had three performances in 2013. One at Burr Weselyan church in Hillsboro, WI; one at First United Methodist church in Tomah, WI; and one at the Elroy nursing home. In addition we sang a live performance on WRCO-FM 100.9, Richland Center, WI which was rebroadcast on WCNP-FM, 89.5 in Baraboo, WI.